"Panel 1 is a celebration of Mexico's indigenous past, artistic genius combined with religious fervor set in a dramatic natural background. 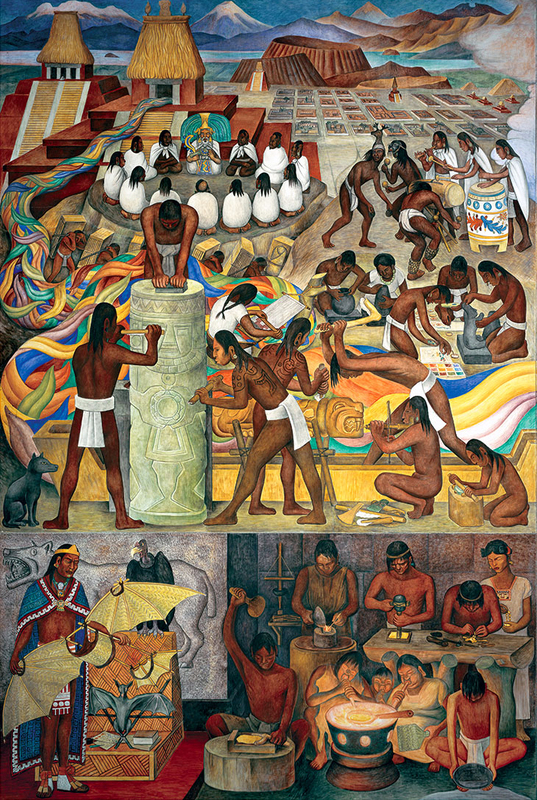 "Rivera wrote, "I depicted the South in the period before Cortes. The outstanding physical landmarks were the massive and beautiful snow-crowned Popocatepetl and Ixtaccihuatl. Nearby were the temples of Nahuatl and Quetzalcóatl and the temple of the plumed serpent. Also portrayed were the Yaqui Deer Dancers, pottery makers, and Netzahualcoyotl, the Aztec poet-king of Texcoco who designed a flying machine. "Panel 1 forms the left side of a visual parenthesis that balances North and South. The right side of the mural completes the parenthesis with a celebration of Northern California's technological boom of the nineteenth century. (See Panel 5.)"